George Eliot said it best "Delicious autumn! My very soul is wedded to it, and if I were a bird I would fly about the earth seeking the successive autumns." Fall is such a beautiful season, no matter where you are on the globe. 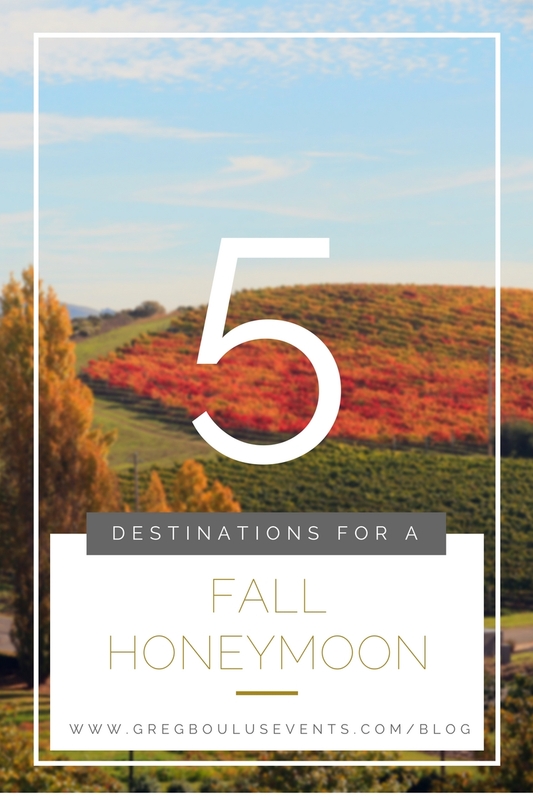 We have compiled a quick list of some of our brides' favorite destinations for their honeymoon. Have you been to any of these locations? What is your top pick? The end of summer marks the most exciting time of year for this beautiful region of the United States. Fall is when harvest season begins all up and down Napa, and the neighboring Sonoma, Valleys. Not to mention this is a foodie's paradise with renowned restaurants scattered across the valley. While this is considered high-season, it is a cannot miss experience for all our wine-lovers. Fall is the perfect time to honeymoon really anywhere in Europe but Italy is particularly beautiful at this time of year. Especially considering that the weather has cooled off and the large crowds have dissipated. Between the beautiful cities of Rome and Florence and the quaint coastal towns along Cinque Terre it is too easy to plan a packed itinerary full of romance, wine, and lots of pasta! For those couples who are looking for a Caribbean honeymoon but want to avoid hurricane season, it's best to stick to those islands that fall below the hurricane belt. Plus the islands are always less crowded this time of year! For our more adventurous bride and grooms, Canada in the fall is the perfect destination. A popular destination in the winter, the temperatures are more mild this time of year. And for those who love storm-watching, stick to the coast to see some pretty epic thunder and lightning dance before your eyes. Sounds like the coziest, most romantic honeymoon ever. One can never go wrong with a trip to Hawaii. Weather is nearly perfect all year-round! While each island has something different to offer depending on the desires of the couple, our personal recommendation is the island of Kauai. The oldest and most lush of all the islands, Kauai is the perfect balance of nature and luxury. Stay at either the St. Regis in Princeville or the Grand Hyatt in Poipu.